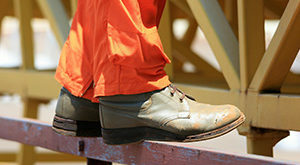 While every hard working man should invest in a high-quality pair of work boots, it’s a crucial accessory for linemen. 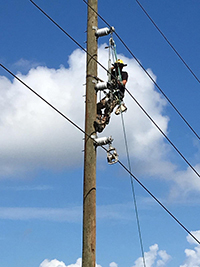 If you’re a lineman, you probably spend your days climbing up poles and reaching heights that would make any average person quiver with fear. Your job is an important one. Climbing to extreme heights is necessary to provide the rest of us with the electricity we need to live in modern society. Linemen have more inherent dangers than those who work on the ground. As a result, your equipment and footwear play an important role in your overall safety. It’s important that you invest in a solid pair of work boots that are built to tackle the unique aspects of your high-flying job. It’s not always easy to find boots that work for you. Here are some great options to get you started on your search and some information about how to pick a pair that’s right for your job. These work boots from Red Wing look great and provide ample protection for linemen. The boots are covered in leather. The material is treated for longevity. Scuff marks are easy to get rid of with a bit of rubbing. The outsoles are made out of nitrile cork. There’s a thick, one-inch heel as well. The heel is great for climbing up a ladder or hooks. Inside, the heel, there’s a shank for support and rigidity. The toe portion of the boots features a subtle hump. This creates more room for your toes inside. Durable stitching is used throughout for ultimate durability. The outsoles are attached with solid welt construction as well. Stay safe in any environment with these work boots from Chippewa. The uppers are made out of 100 percent leather. The entire boot is waterproof. The stitches are all reinforced and protected to prevent water penetration. On the bottom of the boots, you’ll find a thick synthetic sole. The sole features large lugs for enhanced tractions. There’s also a thick heel with a noticeable arch drop that helps with climbing. Inside, the boots are insulated. There’s also a Dri-Tex lining. It helps to wick away sweat so that you can stay comfortable throughout the day. These rugged work boots are specifically designed for climbing. They feature a thick synthetic sole. The tread design on the sole is great for climbing up poles. The lugs will keep you stable, even in the rain. The outsoles also have a high heel with a pronounced arch that’s rounded. The uppers are made of high-quality leather. Plenty of padding can be found inside and outside of the boots. Its located along the rim of the shaft and behind the tongue to prevent chafing as you climb. For added support, a steel shank is built into the sole. 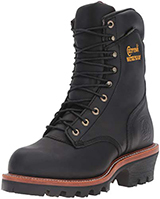 The Wesco Highliner boots were purpose-built with linemen in mind. They have a number of great features that address the many obstacles that linemen face. For example, they have Vibram soles that are designed to provide you with great traction as you climb. They’re complemented by a pronounced heel. The heel can give you more support on the ground and in the air. A steel shank inside the sole offers further support. It’s slightly arched. Not only does this make it more comfortable to wear, but it also provides some assistance while climbing pole rungs. The uppers are made out of leather. They extend far beyond the ankle for added protection. These boots offer great protection in a stylish package. 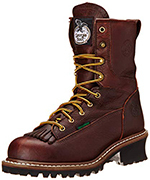 The uppers of the boot are made of 100 percent leather. They have a deep chocolate color and a few design cues that stand out. When it comes to performance and protection, these boots don’t disappoint. The soles are made of thick rubber and feature long treads for better traction. There’s also a higher heel to assist you as you climb. The entire boot is waterproof. The uppers also extend about eight inches from the shaft. The longer boot shaft allows offers more protection from physical damage to your leg. While standard work boots may look like they’re enough, they don’t have all of the job-specific features you need to stay safe. Linemen have some unique work environments. Oftentimes, you have to deal with additional hazards you have no control over. Here are some things you should look out for when you’re shopping for work boots. These features can make all the difference when you’re climbing tall poles. 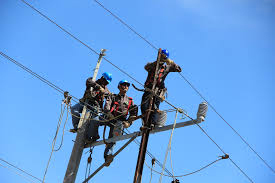 A lineman’s job is to work with electrical transmission systems. Chances are, you’re working around high voltage lines on a regular basis. Needless to say, you’re going to want to have some protection against electrical shock. While many people don’t realize it, your shoes play an important role in the outcome during a shock. Electricity can travel through your body and into the ground in an instant. One of the biggest lines of defense against electrical shock is rubber shoes. 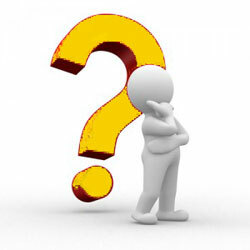 Rubber is an insulator that blocks the electrical signal. 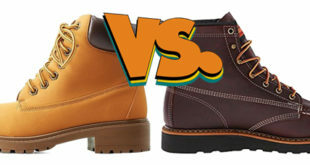 When you’re looking for a pair of work boots, stick with options that have a thick rubber sole. You can also get work boots that have some form of rubber insulation. That layer of rubber creates an effective barrier between your body and the ground. It’s important to avoid work boots with large pieces of exposed metal. Some boots use metal on toe caps, metatarsal guards, puncture plates, and heel shafts. While these features are great for other professions, they can prove to be fatal for a lineman if the metal is not surrounded by rubber. You can still get these safety features. Just make sure that the metal isn’t exposed. Waterproof boots are great for keeping you healthy and protected in bad weather. Linemen often work in terrible weather because that is when power lines are at the highest risk for damage. You may find yourself climbing poles in the heavy rain. Even when you get off the power pole, you’re going to be treading in thick mud. Waterproof work boots will make sure that none of that makes contact with your feet. Not only can you remain comfortable, but you can stay healthy. Water leaks inside your boot can quickly lead to hypothermia, especially in cold environments. High-quality work boots are built with waterproofing in mind. 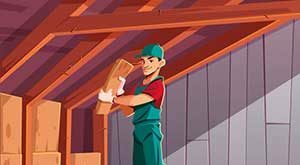 They may feature solid construction methods that prevent leaks between seams. They’re also treated to repel liquid. Choosing the right outsole is crucial. The rungs on a utility pole are small, slippery, and dangerous. The outsoles of your boots are going to be what keeps you stable as you climb up. It’s a fine balance between finding a boot that’s too soft and one that’s too hard. Thinner soles tend to be more flexible. They allow you to feel the pole with your feet. However, this comes with a tradeoff. Thinner soles get uncomfortable pretty quickly the longer you’re standing on a pole rung. Thicker soles provide you with more support in the air. They’re solidly built and can hold up to years of climbing. However, these types of boots are notorious for becoming slippery when it rains. Because most pole rungs are made out of smooth metal, this can be very problematic when the weather turns. One good way around this dilemma is to pay attention to the treads on the bottom of the soles. As a lineman, you need to get boots with anti-slip soles. On these boots, the treads are designed to redirect water away from key pressure points on your foot. They can improve your grip as you climb, keeping you safe in the process. A higher heel can complement the anti-slip treads on your boots. Sometimes, heels can be uncomfortable on the ground. However, when you’re climbing a tall utility pole, they can be the difference between staying stable and slipping. Higher heals have a dramatic dip on the arch of the foot. This small dip can be used to grasp onto ladder rungs and climbing hooks. Even when you’re hanging from a harness, that small dip is the perfect place to loop a rope around. It’ll help you keep your footing, even when you’re dangling 40 feet in the air. Finally, comfort should always be something to look for. You’ll be wearing your work boots for at least eight hours a day. It’s important to invest in something that can keep you comfortable. Staying comfortable is the best way to stay safe. 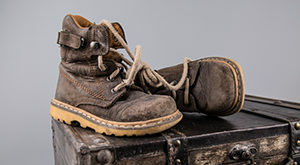 Furthermore, comfortable work boots can help you avoid lasting health issues. Some great features to look out for include interior padding, a solid midsole, and great arch support.